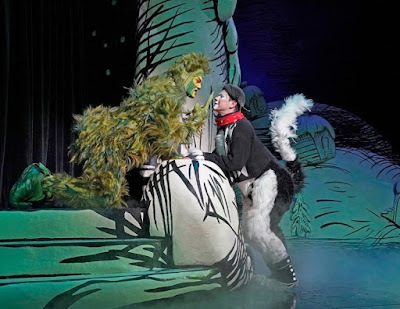 Carol's Theatre Reviews ~ It's Fun To Go Out: “How The Grinch Stole Christmas” Still Going Strong At 21. “How The Grinch Stole Christmas” Still Going Strong At 21. 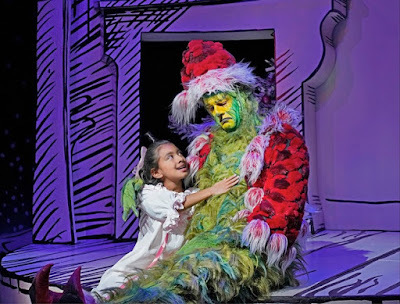 Coming back to see “How the Grinch Stole Christmas” now on the Donald and Darlene Shiley Stage of the Globe through Dec. 29th was, for yours truly, like revisiting an old family member not seen in some time. I gave myself a pass these past years after having taken grandchildren of friends to my own grandchildren to friends who wanted to be part of the local scenery. Now it was time for a re-visit just for old times sake. “How the Grinch Stole Christmas”, the animated television special won the Peabody Award in 1997. The book, itself, was published in 1951. In 2018, Ted Seuss Geisel, San Diego’s quintessential Dr. Seuss, is still alive and kicking, if but in memory only. 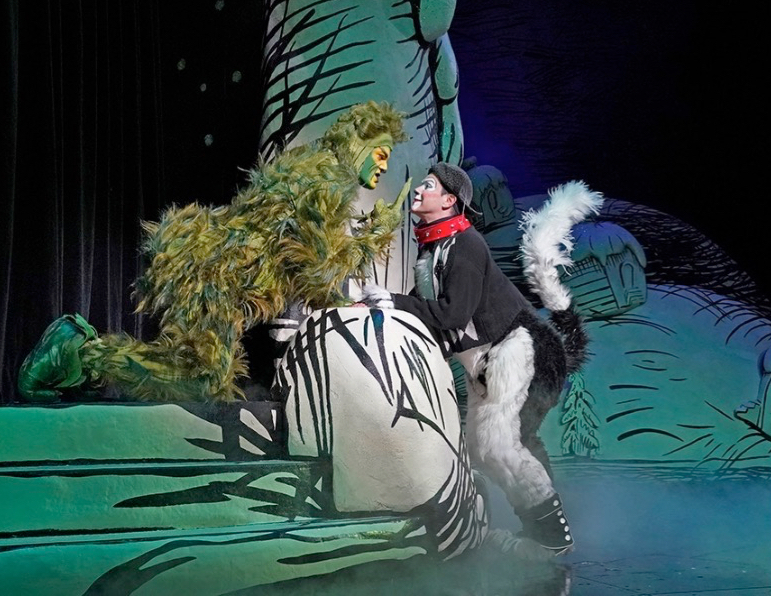 With a generous sponsorship grant then, of $250,000, the San Diego Union-Tribune underwrote this new ‘Grinch’ musical that would become a holiday tradition. 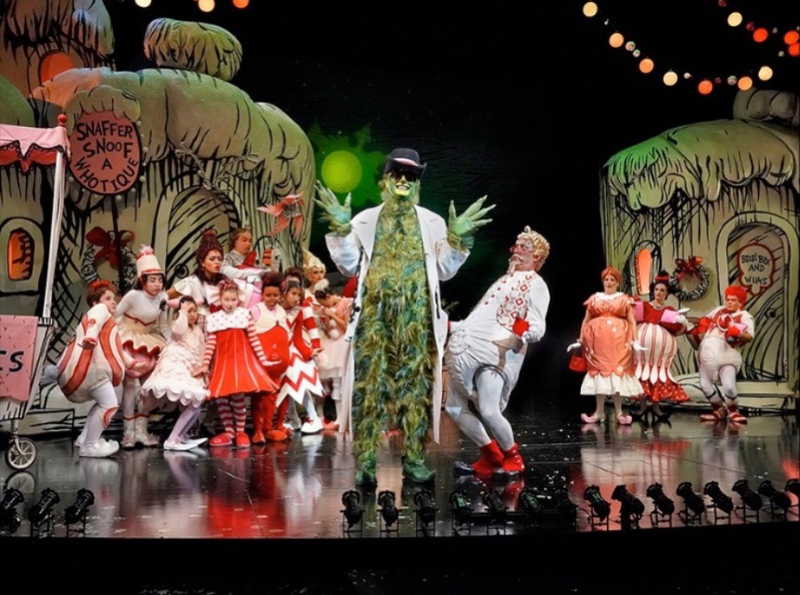 Making the project come alive for stage, Audrey Geisel freed the rights to the Grinch character and the rest as they say is history. Geisel added additional lyrics and Jack O’Brien, who conceived and directed this gleeful ditty back then, is still a major player on stages all over the globe (no pun intended). With book and lyrics by Timothy Mason, music by Mel Marvin, James Vásquez is currently in the director’s chair. Additional music by Albert Hague and John DeLuca’s original choreography with additional choreography by Bob Richard complete the picture. To say that the productions run like a well oiled machine would be an understatement. 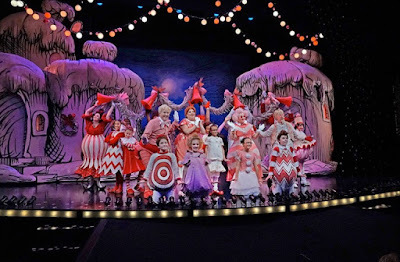 It’s an all -star cast this year consisting mainly of local San Diego actors that made my recent revisit a delightful journey into Who-ville to see the ever- optimistic ‘Whos. 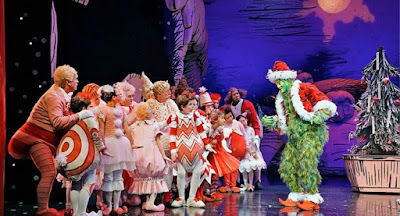 The young and not so young audience was filled with anticipation to see how The Grinch would steal Christmas. No doubt after the show, there were many wanna be Cindy Lou Whos, and who knows. In case you missed the story: Just north of Who-ville home of the Whos, the Grinch (the gleefully mean spirited Edward Watts sometimes verrry scary yet a hoot as he dances his soft shoe with Young Max) who just hates Christmas and all it’s trimmings (“I Hate Christmas”, “One of a Kind”), awakens from his long snooze to wreak havoc on the Town of Whoville and the entire family of Whos. He’s convinced if he steals the presents and decorations of the happy folks in Who-ville that he can cancel their Christmas. Much to his chagrin it doesn’t really matter since he learns later, it’s the spirit and the heart of the holiday that counts (“It’s the Thought That Counts”). 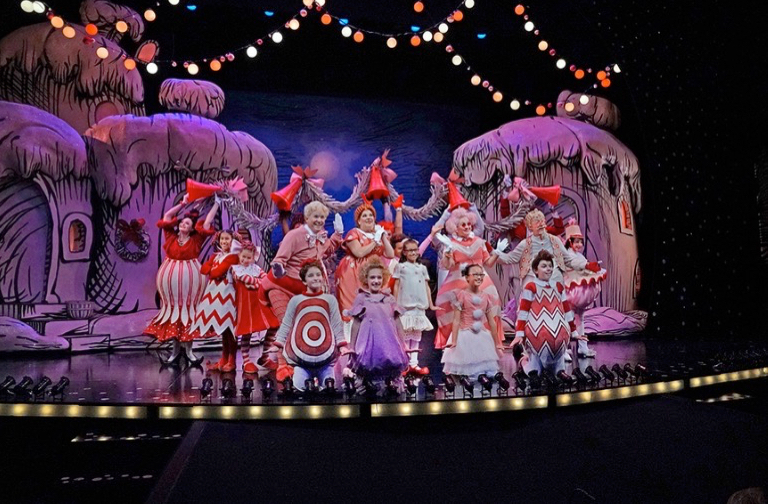 And he learns it from little Cindy Lou Who (an adorable and confident little munchkin in the form of Leila Manuel). Robert J. Townsend and Bets Malone are Papa and Mama Who and who could ask for a more talented two? Grandpa and Grandma Who are Larry Raben and Kyrsten Hafso Koppman, a wonderful pair too. John Lee Beatty’s set is right out of Who-ville including dancing and singing puppets appearing over the housetops. 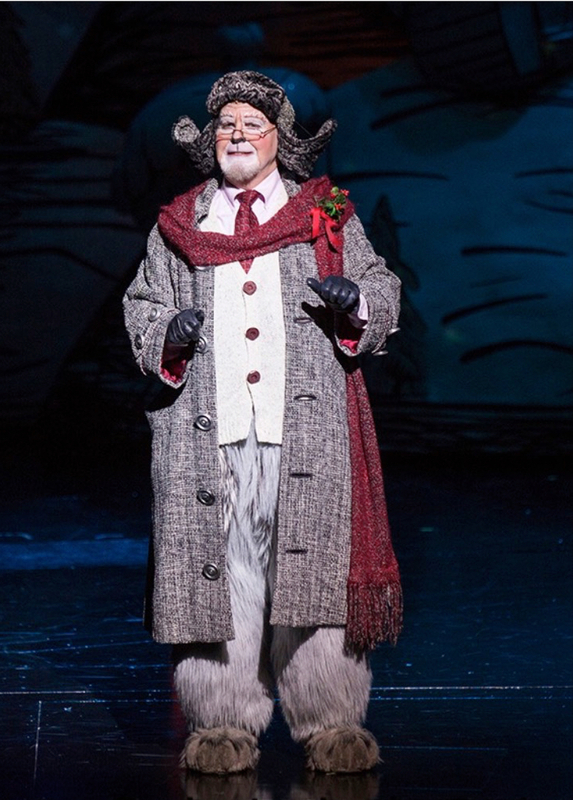 Robert Morgan costumes are apropos as comic book characters come alive looking like they jumped straight out of one of Dr. Seuss’ books. From the green furry Grinch to hour -glass and lamp -shade shaped dresses and wigs piled like swirls the costumes are pretty unique, but then again so is Dr. Seuss. It’s all in the holiday spirit. Get there early and marvel at the gynormus tree standing tall in the middle of the courtyard for all to snap pictures and revel in the tiny tykes with their Grinch gear and ballerina dresses.